You know that when your North Myrtle Beach vacation includes reservations at Ambassador Villas you will have a phenomenal and relaxing retreat on the oceanfront. The luxurious North Myrtle Beach vacation rentals at this North Myrtle Beach resort are divine. They are brimming with conveniences and the sun deck at Ambassador Villas features sparkling blue water amenities. Inside and out the amenities are delightful. Settle into your luxurious North Myrtle Beach condominium rental at Ambassador Villas and enjoy all the amenities that are at your fingertips. These North Myrtle Beach rentals accommodate large numbers of people so your family and friends will appreciate the fully furnished kitchen that is part of your North Myrtle Beach condominium. Designed to make everyone in your group most comfortable during their ocean view stay, the kitchen in these condos in North Myrtle Beach, SC include full-size refrigerators, sometimes a double refrigerator, oven, dishwasher and microwave. A large dining table encourages you all to have breakfast together in the morning. Take your coffee out to the ocean view balcony and enjoy the sea breezes and sunshine first thing in the morning of your North Myrtle Beach vacation. Additional amenities in these luxurious North Myrtle Beach vacation rentals include ceiling fans, numerous televisions and DVD players and high-speed Internet access. You will also find a washing machine and clothes dryer in the convenience of your North Myrtle Beach rental at Ambassador Villas. Some of the North Myrtle Beach condo rentals have a game room that features a pool table. There are at least two levels of ocean view balconies in each of these condos in North Myrtle Beach, South Carolina. Enjoy the Atlantic Ocean views from throughout your luxuriously furnished and innovatively designed North Myrtle Beach rental at Ambassador Villas. There is covered parking at this North Myrtle Beach resort and stairs that lead from the ground-level parking that is underneath this North Myrtle Beach resort on stilts to the stairs and elevator that lead to the second and fourth floor hallways. The ground level at Ambassador Villas is also where you will find the beautiful pool deck. 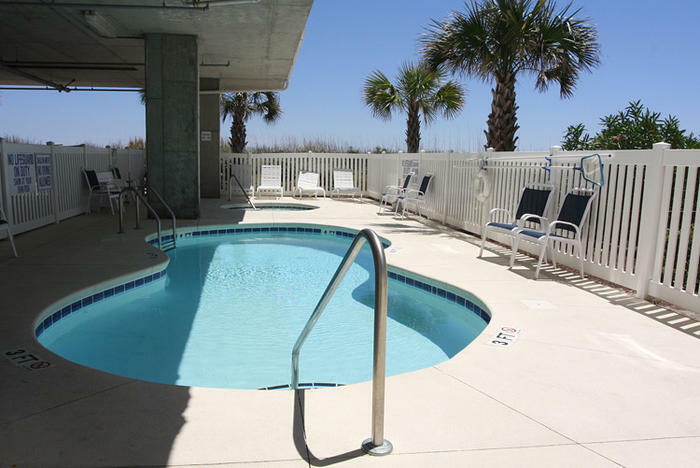 A sparkling blue swimming at this North Myrtle Beach resort is half covered. You will find the same design with the relaxing hot tub. It is also half covered. Take it easy poolside and listen carefully for the soothing sound of the waves crashing ashore at Ambassador Villas. Palm trees on the oceanfront really set a tropical scene for your North Myrtle Beach vacation. And the oceanfront grill area features chairs and picnic tables so you can fully enjoy a beachside barbecue during your North Myrtle Beach vacation. Skip out to the beachfront from the pool deck and marvel at how quickly you can go from your plush North Myrtle Beach condo down to the white sandy beaches. Kick off those flip flops and let your toes feel the warm sand. Wade in the shallow water of the surf zone and look carefully for seashells and sand dollars that are half buried in the sand. Come out to the beachfront at sunrise and you will be amazed at the dazzling light show before you. Watching the East Coast sunrise is a gift and when you vacation at Ambassador Villas in North Myrtle Beach, SC you can easily catch such a show. Tickets are free and everyone may have a front row seat to this memorable production. Take a cup of coffee down to the oceanfront with you and be sure to bring along your camera for postcard-perfect snapshots of the sun first peeking over the watery horizon. Ambassador Villas is beautifully located in the popular Ocean Drive section of North Myrtle Beach, South Carolina. When you vacation at this North Myrtle Beach resort you are within walking distance of beach clubs where live beach music is often on the calendar of events and shag dancing occurs all the time. The Shag is the South Carolina state dance and many places around town offer shag dance lessons. Learn how to glide around the dance floor while your favorite beach tunes play in the background. A trip to North Myrtle Beach, SC really should include at least one shag dance on the dance floor, because this is the birthplace of the Shag. Also in close proximity to this North Myrtle Beach resort are shopping, dining and live entertainment venues. Parasailing, banana boat rides and Sea Doo rentals are among the water sports offered nearby and fishing options include pier fishing, boat rentals, head boats and deep-sea fishing charters. Don’t forget that Myrtle Beach has more than 100 golf courses so bring your golf clubs if you like to hit the links. Your golf course options are plentiful in the Myrtle Beach area. Elliott Beach Rentals is not affiliated with onsite management or the HOA of Ambassador Villas.